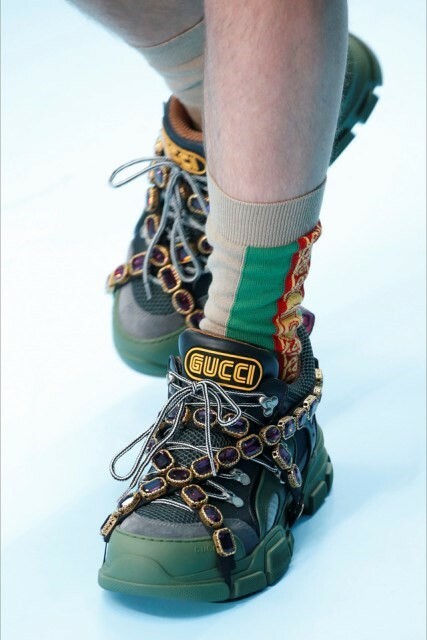 Gucci’s Journey trainer: a beautifully hideous hybrid of the ugly sneaker and spiritual crystal trends! We’re over halfway through 2018. After you’ve had a moment to let that sink in, take the opportunity to reflect – not on how we’ve contributed to society-at-large or advanced down the path to spiritual enlightenment, of course, but on what’s been hot or not in the past six months. Because there’s been a lot; from tiny sunglasses to ironic sartorial statements, we’ve been cycling through trends faster than the US President has been cycling through completely contradictory statements (it’s been a weird half a year, hasn’t it?). Should we be wearing glasses too small to cover our eyeballs or ones that are basically ski goggles? Should we be carrying a micro-handbag à la Rihanna? But then where will we store all of our healing crystals? Truly, questions which matter. But don’t worry. We got you. Read on. Skechers were monopolising the chunky sneaker game until the now-five-year-old Ozweego, a collaboration between Raf Simons and adidas, burst onto the scene. The divisive trainers are now in their third iteration, but have perhaps been overshadowed by the iconic (and to some, downright offensive) Balenciaga Triple S since they dropped in 2017. More recently, ‘ugly’ trainers have seen uptake from even more high-end brands; Vetements collaborated with Reebok at the end of last year on emoji-laden trainers, while in February 2018, Louis Vuitton debuted the Archlight, a futuristic AF design. Margiela, Gucci, Calvin Klein and Dior have all had a go too over the past year, seemingly testing the limits of what people will happily pay £700-£1000 for. First seen: Five years ago, with the Ozweego’s release. Peak: When every celebrity and their mum was getting papped in the Triple S.
Staying power: Well, Demna just debuted some spiked trainers at Vetements’ latest show, but we can’t go on like this for much longer, surely? These popped up at Balenciaga’s SS17 menswear show and in the Parisian label’s following SS18 campaign, as well as on Prada’s SS18 catwalk and Rihanna, who wore them as part of her Dazed cover shoot. Since April, and thanks mostly to designer George Keburia, slimline frames have been worn by Gigi Hadid and Kendall Jenner – pretty much cementing them as a bona fide Trend with a capital T. Ryan Reynolds mocked them on Instagram last week and of course we can’t forget the time that Kanye West sent Kim Kardashian a moodboard about them either. But are they still hanging around, now the sun’s come out and we actually need some decent eye-protection? Well, apparently, yes. First seen: Mid-2016, as just one of many trends to be born at a Balenciaga show. Peak: When Kim revealed that Kanye had banned her from wearing big shades. Staying power: Pretty steady, judging by this year’s catwalks (see Miu Miu, Louis Vuitton, Martine Rose, etc). But are they about to be usurped by Oakley-esque frames? We'll soon see. Kanye may be to blame for the rising popularity of transparent garments both on and off the catwalk; he’s incorporated see-through shoes in every Yeezy collection since Season 2 (the PVC pinnacle being those thigh-high boots from Season 4 that steamed up and ended up resembling a poorly-maintained fish tank). Still, they’ve enjoyed popularity elsewhere, too. In late 2015, transparent plastic pants made an appearance at Loewe’s SS16 show, while 2017 saw a sleek, lucite briefcase from Helmut Lang and similar shopping totes from Maison Margiela and Céline hit the runway. Though impractical, the clear materials caught on, partly in the form of those window-kneed jeans from Topshop which were raved about and ridiculed in equal measure – the true sign of a rising trend. Recently, this trend’s ongoing strength has been indicated by Virgil Abloh (perhaps unsurprisingly, since he’s best pals with Kanye), who released a see-through suitcase with luxury luggage company Rimowa this June. First seen: In recent history, Kanye has to take responsibility for this one. Peak: Karl Lagerfeld’s Chanel SS18 collection featured clear plastic hats, bags, boots, and coats, signalling a complete embrace of the transparent trend. Staying power: Judging by that suitcase’s runway appearance during the menswear shows, oversharing with your accessories isn’t over yet. There’s something almost cultish about the crystal trend. Kim Kardashian, Bella Hadid, and Gwyneth Paltrow (ofc) have all professed their loyalty to the mystical healing/nurturing powers of the multicoloured stones. This year though, crystals made it to the catwalk, too; Mary-Kate and Ashley Olsen handed them out during NYFW at The Row’s AW18 show, while in London Ashley Williams incorporated them into her invitations in a celebration of Britain’s druidic roots. Gucci, meanwhile, combined the ugly sneaker trend with the crystal hype, resulting in the Journey trainer. Now it’s evolving, with high street stores capitalising on the trend: see ‘Selenite Crystal’ lamps, etc, etc. First seen: Literally thousands of years ago. But they have had a resurgence since they studded Christopher Kane’s Crocs in his SS17 collection. Peak: Victoria Beckham incorporated special pockets into her SS18 collection for clandestine crystal carrying, which is a new level of dedication. Staying power: Bizarrely strong. With slightly sketchy but surprisingly widely-believed health benefits and endorsements from Kylie Jenner, they look like they’re here to stay for a while. Irony has been an overarching theme this year and the hot-pink, tacky, touristy bag from Balenciaga’s AW18 show epitomises this perfectly. A big part of this trend seems to be its propensity for nostalgia: Stella McCartney channelled the 60s in her AW18 offering inspired by the pulpy portraiture of painter J.H. Lynch, while Tom Ford stole from the 80s with glitzy gems and sequins, oversized hoops, and jarring (often animal print) patterns. At Rei Kawakubo’s AW18 Comme des Garçons show in March, meanwhile, kitsch and camp reigned supreme in an homage to Susan Sontag’s seminal essay Notes on ‘Camp’, featuring cartoon motifs and blue and pink leopard print. First seen: Kitsch has been around for a while (see any Moschino collection since Jeremy Scott became creative director in 2011). Peak: Speaking of Jeremy Scott’s Moschino, his AW18 show for the label incorporated oversized sequins, bright and brash red/yellow stripes, and blue-skinned aliens based on Jackie O. It was about as kitschy as it gets. Staying power: With a move towards no-frills silhouettes from Stella McCartney and a more traditional, muted palette from Tom Ford’s SS19 menswear preview, things seem to be veering towards the less-kitschy, but you only need to look at the current Y2K resurgence to see that tackiness it back. The embryonic form of the micro bag trend can be traced back several years, but it’s this year that Louis Vuitton, Fendi, and Jacquemus fans have been clamouring over handbags too small for your phone (because who wants to carry belongings around anyway?) Jacquemus’s version has been perhaps the most popular – especially juxtaposed with those enormous straw hats – clutched (or rather pincered) by Kendall Jenner and Rihanna, among others. There was some ridicule of the the designer’s miniscule bag in Dua Lipa’s Insta pic earlier this month, though: “Girl what you gonna be putting in the purse? Donald Trump’s IQ???”. A reasonable question. First seen: Prada AW12 sticks out for doing the tiny bag trend before the tiny bag trend was a trend. (Try saying that after a drink). Peak: Jacquemus’s iteration – Le sac Chiquito – has been the micro bag in the limelight. Staying power: What with the mockery and the obvious inconvenience, they can’t be sticking around long... can they? Whether 90s nostalgia, the obsession with reappropriating sportswear, or the ‘ugly’ dad aesthetic are to blame – it’s most likely a combination of all three – wraparound sunglasses with garish, reflective lenses are so hot right now. Oakley-style glasses have appeared at runway shows from Stella McCartney, Maison Margiela, and the 2017 LVMH Prize winner Marine Serre. Actual Oakleys have graced the catwalk, too, at SS19 shows from Alexander Wang and Heron Preston. The cycling fashion bug doesn’t stop at glasses either; since Virgil Abloh made cycling shorts cool at his Off-White SS18 show, they’ve been spotted on basically every woman with a live-in stylist and an Instagram following over 400k. First seen: Rihanna was an early adopter of cycling shades when they hit the Fenty Puma runway in September 2017. Peak: Definitely when a pair of Oakleys – with added metal spikes – appeared on the runway at Demna Gvasalia’s Vetements show during Couture. Staying power: Oakley have a plethora of recent and upcoming collabs with Palace, A-COLD-WALL*, and Kith, so we’re going to keep seeing its cycling shades until SS19 at least. “The response to the demi-denims has been totally overwhelming. We had thousands of comments across social media and not one of them was neutral,” designer Ksenia Schnaider told us this month, discussing her creation – a combo of denim shorts and jeans, stitched together. It’s no wonder that none of the comments were neutral; like so many trends this year, the demi-jeans are of the love-it-or-hate-it variety, offering lots of scope for fervent debate over social media. In favour of the divisive demi-jeans’ longevity, Schnaider’s aim is to promote sustainability with the upcycled jean-jort hybrid. First seen: Schnaider’s demi-denims have been creeping into our Insta feeds since the start of the year. Peak: Gigi Hadid’s Insta pic with Karl Lagerfeld – in which she was wearing one of Schnaider’s denim skirt/jean combos – was pretty big. Staying power: With social media buzz and endorsements from both Hadid sisters, and Dua Lipa, these stand a good chance of clinging on for a little while at least. The practice of splicing and restitching designs to create something new and original has seen some traction lately. Marc Jacobs and Off-White have had a go, as has Central Saint Martins’ Conner Ives, whose dresses are often stitched together from repurposed vintage t-shirts. Arguably, it was Gosha Rubchinskiy’s SS18 show – with its half-navy-half-beige trench and fractured tartans – that really kickstarted the 50/50 trend, which has since gained visibility as it’s been picked up at Prada, Balenciaga, and Maison Margiela. First seen: This trend can be traced back to Demna Gvasalia’s Antwerpen tee for Vetements, which was chopped and restitched to distort its logo. Peak: Did you see Jeff Goldblum in that Prada shirt? Of course you did. Enough said. Staying power: The whole 50/50 thing takes some guts to pull off, which might detract from some of its popularity. Will that be offset by the Goldblum endorsement? Only time will tell.